Denoting or relating to a primitive type of motor nerve mechanism, such as is found in the peripheral and the ganglionic nervous systems. Characteristic of the movements of the body's connecting junctions: The remarkable arthrokinetic movements of Jack, the long distance runner, were recorded on film so future runners could study his techniques. 1. The practice of self-denial or severe self-discipline for religious reasons: Historians report that many of the early Christian leaders were extreme ascetics who denied themselves normal physical pleasures and dedicated their lives to serving God. 2. A person who renounces material comforts and leads a life of austere self-discipline; especially, as an act of religious devotion: There have been ascetics who have devoted their lives to God with prayer, fasting, and consecration or solemn commitment to helping those who were in need of spiritual and physical help. 3. Etymology: used since about 1646, from Greek asketikos, "rigorously self-disciplined", from asketes, "monk, hermit"; from askein, "to exercise, to train"; originally, "to train for athletic competition, to practice gymnastics, to exercise". The noun meaning "one of the early Christians who retired to the desert to live solitary lives of meditation and prayer" is from 1673. Ascetic actually goes back to Greek asketes, "an athlete in training". The Greek word for athletic training is askesis, and from it we get ascesis, which means "rigorous self-discipline" or "training". 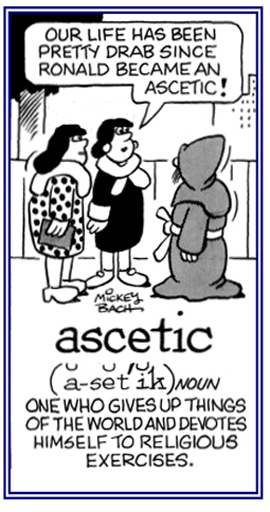 Very much the same thing is denoted by "asceticism", which was first used in English by Sir Thomas Browne in 1646. A reference to or characterized by the omission of conjunctions in sentence constructions in which they would normally be used: Harry's mother prepared him for life with honesty, with a good education, with self-respect; which illustrates an asyndetic element by leaving out "and with self-respect". 1. Characterized by or involving physical activity or exertion; active: "She had an athletic lifestyle for most of her life." 2. Physically strong and well-developed; muscular: "Brent was an actor with an athletic physique." 1. Living at the bottom of lakes or marshes. 2. A reference to the deep-water regions of a lake. The art of producing and publishing books. Sometimes it takes the publishing industry so long to produce books that it's no wonder so many are posthumous. Showing page 4 out of 8 pages of 112 main-word entries or main-word-entry groups.